Beautiful Voices is our ongoing blog series that highlights inspiring, empowering women. Our most recent Beautiful Voice is Debra Anzalone. See what she says when Annmarie asks her some questions about her own personal beauty. Debra Anzalone is the mother of two beautiful daughters, Tiffany (33) and Tracy (31 and pictured here with her mom). She is married to her best friend and the love of her life of 33 years, Fanancy Anzalone, MD, MPH. She is a Registered Nurse with a BS in Nursing from Boston College, an MPH (Masters of Public Health) in Health Education/Communication and a DrPH (Doctorate of Public Health) in Health Systems Management from Tulane University School of Public Health and Tropical Medicine. She is a certified Aerobics, Spinning and Yoga Instructor. She has been practicing hot yoga for 6 and a half years, and attributes her daily hot yoga practice to her personal transformation. She resides in South Florida where she enjoys many outdoor activities such as boating, kayaking, stand up paddle boarding, snorkeling, hiking, cycling, and running. She loves her three dogs: Luca, an Imperial Shitz-tsu, Lola, a Siberian Husky, and Luna, a blue merle Australian Shepherd. I used to believe that the many roles I have served in my life defined me: wife, mother, caregiver, nurse, friend, sister, daughter, doctor, professor, student, Navy spouse, blogger—and spinning, yoga, and aerobics instructor. But after recently embarking on a spiritual journey through the study of yoga and a daily hot yoga practice, I discovered that these various roles do not define me. Rather, I am on a journey much larger than any one role could ever define; a ride that challenges Mr. Toad’s Wild Ride; a journey of epic proportions; way beyond my wildest dreams! Life, as I knew it, came to a screeching halt, like someone took the needle off the record, on January 17, 2003; the day my younger daughter Tracy’s heart stopped beating after a “routine” surgery performed at an American hospital in Naples, Italy. Tracy was spending her junior year abroad studying International Relations in Florence, when while standing in a pedestrian zone with her sister, Tiffany, and three friends, she was hit by a car. Everyone experienced minor injuries, but Tracy suffered the brunt of the impact, breaking her ankle, and receiving multiple lacerations and torn muscles, requiring surgery. Tracy woke up from the surgery and was given a mega-dose of three medications for pain after being extubated, resulting in respiratory depression, leading to severe cardiac arrest. My daughters Tiffany and Tracy are my biggest inspirations! 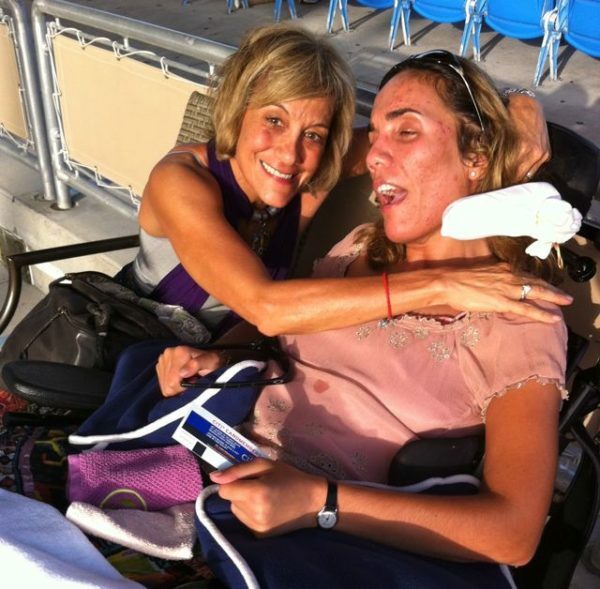 Tiffany was with her sister, Tracy, when she was hit by the car in Florence. She has been a pillar of strength throughout Tracy’s journey, putting her life plans on hold for nearly two years to help with Tracy’s care. Tracy is an inspiration to all she meets, and she continues to teach life’s most important lessons without uttering a single word. And so began our journey of caring for our daughter, Tracy, who was successfully resuscitated, but was left with major brain damage, resulting in quadriplegia, a feeding tube, the inability to talk, and requiring total care. It was at this time in my life that I surrendered to a higher power, realizing there is a divine plan over which I had little control. Even though we were living minute to minute for the first several months of our new life, not knowing whether Tracy would survive the day, I leaned on my faith, and my family and friends for comfort and support. It has been a little over ten years since Tracy’s tragic accident, and I cherish every day that I have to hug and kiss her. I am certain I would not have been able to survive this horrific tragedy without the close friendship of my best friend and husband; our love has only deepened through it all. The best advice is a quote by Willa Cather posted on my daughter’s website: www.PrayerForTracy.com: “Where there is great love, there are always miracles.” There are always blessings in our trials and tribulations; the beauty is in seeing them. Beauty comes from the inside, a shiny soul that beams for all to see. It emanates from love, purity, Satya, or truth. One who has found peace in their own existence. What makes you feel beautiful? What do you do to pamper yourself? During my daughter’s long hospital stay, I basically lived in her room, rarely leaving her side. I would look forward to taking a long shower with healthy, natural aromatherapy products that would pamper, nurture and revitalize my physical and spiritual self. Today, I still take refuge in my bathroom, especially when I need to escape, and love Annmarie Gianni’s Organic & Natural Pure Skin Care Products. The Coconut Honey Mask smells divine, and keeps my skin soft and healthy. I even share it with Tracy during her Spa Saturdays. The Anti-Aging Eye Cream is so hydrating, just what I need to counteract the South Florida heat and humidity. The Neroli Toner is perfect after an intense 90-minute Hot Yoga practice, restoring harmony both inside and out. God hold you all, Bless you all….the Universe is supporting you…you all are an in-SPIRIT-ation for all who are touched to find this .. Thank you so much Jacqueline, we are so happy you enjoyed Deborah’s beautiful article. Stories and love make the world go round. Love from us all. Yes! She’s very beautiful and extremely gorgeous! I really admire the love, courage, and faith of this family. Wonderful article! God bless you Debra! Sending you Reiki Energy to help you in your day to day journey. May all the Angels surround you and you Family! Xo Mo please email,would love to chat further. Live~Life! Thank you Mo. We are sure Debra feels the love :). Make it a wonder-filled day :). Awww thank you so much for your beautiful words Sarita. We are so happy the story resonated with you, we are just old fashioned story lovers :). Have a wonder-filled day.